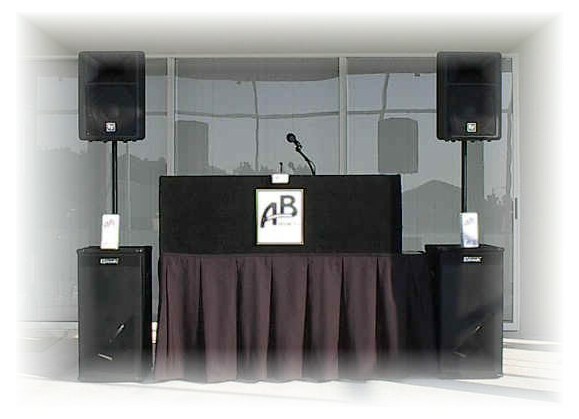 San Jose DJ, San Jose, DJ, San Jose DJ's, Disc Jockey's, Corporate, Weddings, San Jose, San Francisco, Bay Area. AB Productions Mobile Disc Jockey has played at several thousand corporate functions in the Bay Area ranging from parking lot bbq's, and after work beer bashes to performing at two Democratic National Conventions and everything in between. Whether it's a company Christmas party, convention or a full on multi-media presentation AB Productions Mobile Disc Jockey Service can handle your most intricate needs with experience and professionalism. When you are looking for a Mobile Disc Jockey for your company Christmas party I recommend you BOOK EARLY. It is not uncommon for people to book me the night of the party for the following year. I tell every customer if you like the Disc Jockey and even the location, book it the same night of the party for the following year. That way you are not caught up in the Holiday rush. There are only 3 or 4 Friday and Saturday nights in the month of December and every company, and every department wants their party on a Friday or Saturday Night. It is not uncommon for me to receive at least 100 phone calls for those nights. If you book early you will save yourself a lot of headaches. Plus you will get the best possible entertainment for your event, not the left overs. The most Professional and Experienced Disc Jockey companies will always book up first.